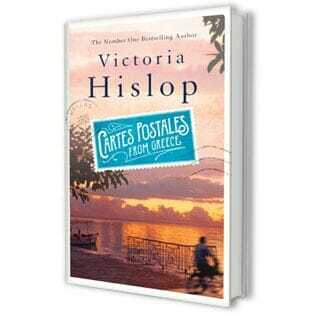 Victoria Hislop first came to Cyprus in 1978. That’s a story in itself. She was 18 going on 19, and answered an ad in the back of a magazine: “Overland journey to Cyprus, £90”. She was just out of school, and “I wanted an adventure” – so she found herself in a packed, battered nine-seater mini-van with a half-dozen other youngsters. Looking back, she says now, sitting at an outdoor café in Phaneromeni Square in Nicosia, there was something very odd about the whole thing. The van belonged to a middle-aged couple, who did all the driving. They were surly and not very friendly; by the end, none of the youngsters would even speak to them. The idea was to see the sights along the way, but in fact all they saw was the inside of the mini-van. They drove and drove, relentlessly – then, in the middle of the night, the van would stop and the passengers would be ordered out to pitch their tents. Victoria recalls “waking up in Belgium in someone’s garden”, being harangued by an angry Belgian woman, clearly having been too tired at 3am the night before even to see where they were camping. Why did this grim-faced couple offer to drive to Cyprus? Maybe just to make some cash – but then why did they take a detour across Turkey, veering east to the plains of Anatolia where the man woke them all up one night to announce that they’d been robbed, and all their money was gone? They must’ve been delivering something, muses Victoria, green eyes dancing with amusement in her lively face, “either delivering or taking”, with herself and the others brought in as cover. A gaggle of wide-eyed young people was much less likely to attract the attention of Customs than two miserable gits in their 50s. Needless to say, that first trip was memorable. Victoria knew about the invasion, 1974 having been “the first summer that I actually remember following current affairs; I was 14, and kind of waking up a little bit”, but she’d somehow forgotten that she was coming to a divided island – and was surprised when the van crossed from Mersin to the occupied north and she found herself in a non-place that wouldn’t even stamp her passport. The rest of the trip (she was here for two weeks) was equally disconcerting. She had very little money, the bulk of it having been stolen – or was it? – in Turkey, and mostly ate watermelon, bread and countless tomatoes that ended up making her violently ill. The tents were boiling-hot and unbearable. The girls were courted (if that’s the word) by Turkish soldiers, but Victoria felt threatened and unsafe. After all, she says, “we were English girls, and everyone makes the same assumption about English girls on holiday. And that wasn’t really my thing”. That traumatic teenage trip left its scars: “I’ve never been camping since,” she admits, laughing merrily. “If someone tells me we’re going to sleep in a tent, forget it!” Fortunately, that dislike doesn’t extend to Cyprus itself – and in fact Cyprus is the subject of her new book The Sunrise, her fourth novel since making her name with The Island in 2005. That debut, a big hit in Britain and even bigger hit in Greece (where it became a hugely successful TV series), was set on the leper colony of Spinalonga, off the coast of Crete; since then she’s written The Return, set during the Spanish Civil War, and The Thread, set in Thessaloniki – and nowThe Sunrise, which takes place in Famagusta before and during the invasion.